Trade fairs where GM Morando has exhibited, publicity campaigns and results obtained. By subscribing to the newsletter GM Morando will keep you updated with the latest news and you’ll have the possibility to receive vouchers for the trade fairs where we exhibit. In 2009 we published an online company catalogue in Edilportale, one of the most important reference sites in the world of architecture. In February a newsletter was sent which had excellent results. In fact, within a few days we were contacted by more than 600 employees in the sector. 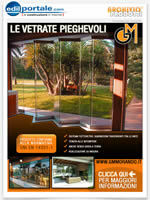 GM Morando and the "Nuova Finestra" (New Window) magazine. 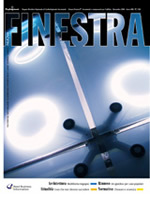 GM Morando decided to run a publicity campaign in 2008 in the “Nuova Finestra” magazine, edited by Reed Business Information. Even on this occasion many sector professionals paid attention to our publication. GM Morando will keep you updated with all the latest news and you’ll have the possibility to receive coupons for the trade shows where we exhibit. Also this year GM Morando took part in the most important trade show of Italian buildings that was held in the Rho Exhibition Centre in Milan from 5-8 October 2011, Pad 9, stand V31. 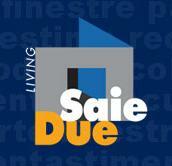 We took part in MADE EXPO 2009 at the Rho Exhibition Centre in Milan from 4-7 February, Pad. 11 Stand P11. VERTICALIA, the architecture exhibition at SAIEDUE LIVING - BOLOGNA, offers a vast panorama of the latest developments in vertical solutions by displaying new materials and innovative technology which can be applied to create new decorative effects for walls, windows and doors. GM Morando took part in the 56th edition of SIA GUEST which took place in Rimini from 25-28 November 2006 (Pad A3, Stand 050).